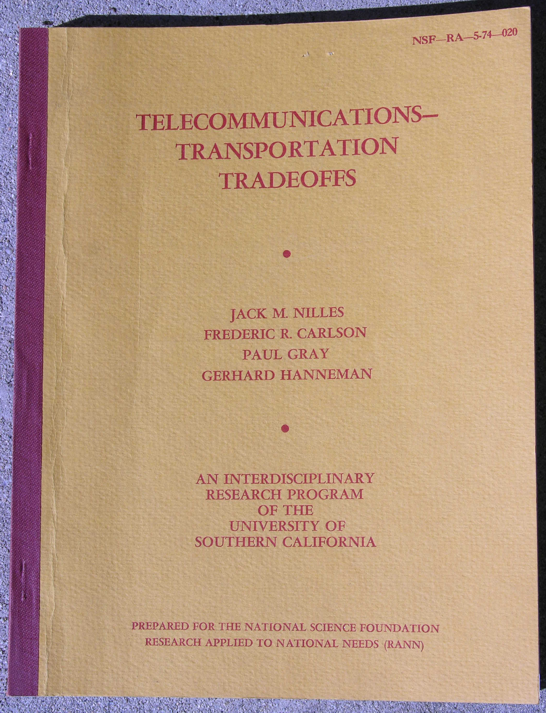 I began my interest in telework in the 1960s but it wasn't until 1973, with the aid of a grant from the National Science Foundation, that my research team and I at the University of Southern California were able to formally test "the telecommunications-transportation tradeoff" in a real-world setting. Using the local division of a large national insurance company as the guinea pig we were able to discover whether this tradeoff of phone lines for freeways could be practical. As it turned out, telecommuting (the term I coined to make the concept easier to grasp) was eminently practical. At the start of the project we had a long list of things that could go wrong, from a collapse in productivity to telecommuter angst. None of them happened! The project was a great success; all the hoped-for positive outcomes occurred. All but one, that is. The president of the insurance company decided not to continue with the telecommuting program after the end of the research phase because of its radical nature. So, in a sense, the operation was a success but the patient died. Thirty years later the same insurance company was again offering telecommuting to its employees.